BOULDER, Colorado -- NASA's newest arrival at the red planet has completed an early checkout of several instruments, offering scientists a glimpse of what's ahead in the probe's up-close survey work. The feature instrument aboard the Mars Reconnaissance Orbiter (MRO) is the High Resolution Imaging Science Experiment (HiRISE), the most powerful camera to ever leave Earth orbit. It is getting high praise from mission team members. The first HiRISE images of Mars were taken March 23. More were made March 25. These will be the camera's only photos for the next six months. It is now powered off in preparation for aerobraking maneuvers to begin soon. Aerobraking is the delicate art of dipping into the thin Martian upper atmosphere. Hundreds of dips are scheduled over the next several months to place MRO into an orbit ideal for science operations. These carefully calculated excursions into the upper atmosphere permit friction instead of fuel to slow the spacecraft down. MRO has been flying in elongated loops around Mars since it entered orbit around the planet earlier this month. It has joined other craft that are also investigating the red planet: NASA's Mars Global Surveyor, Mars Odyssey, the Spirit and Opportunity rovers wheeling about on the martian surface, as well as the orbiting European Space Agency's (ESA) Mars Express. The HiRISE camera successfully took two sets of Mars images. One set of four images was designed to test spacecraft "jitter"-the effects of moving parts in other MRO instruments on HiRISE images. Those jitter evaluations were successful. The test shots also showed great clarity of the surface and are expected to be released at a later date. "The jitter images look great, except for a few percent of the lines which are smeared due to jitter. We were trying to measure the jitter...so this test was a success," Alfred McEwen, HiRISE principal investigator of the University of Arizona in Tucson told SPACE.com. HiRISE will image many areas totaling about one percent of Mars' surface in unprecedented detail, revealing features as small as 3 feet (one meter). Ball Aerospace here in Boulder built HiRISE for the University of Arizona. "The HiRISE images are terrific! And these are engineering images and not final science images taken from the final MRO orbit," said Jim Graf, the MRO project manager at the Jet Propulsion Laboratory (JPL) in Pasadena, California. "The high signal-to-noise sensitivity of the instrument stands out in the images," he told SPACE.com. Graf said the images also depict the excellent work done by the government, industry and university team in designing, building, and operating the most advanced camera ever sent to another planet. "The team did a great job of planning and implementing the acquisition of these very difficult images." But stay tuned, Graf added: "The images returned next fall, after we have achieved the final science orbit, will enable new insights of Mars and will help to identify future landing sites." Graf noted that two other imagers on MRO were also turned on and acquired all of their planned images. The data from the Context Camera (CTX) and a Mars Color Imager (MARCI) will be released later. Both instruments were developed by Malin Space Science Systems of San Diego, California. "The spacecraft is in good health and we are not working any anomalies or issues. The team is preparing for aerobraking start," Graf said. Even though the HiRISE images were taken in test mode, they have already generated scientific interest. "One thing that caught my eye was how sharp the small craters appeared," said JPL's Richard Zurek, project scientist for MRO. That sharpness, he said, will help improve the dating of the surface, enabling scientists to separate primary impacts from objects that bounce across Mars to create secondary features. Zurek said HiRISE has the ability to resolve debris at the base of scarps, in craters, and other places that should help researchers test various geological formation theories, "once we get the best HiRISE resolution from our primary science orbit," he told SPACE.com. The resolution of the HiRISE test images is not as good as the very best currently achieved by the Mars Orbiter Camera on the Mars Global Surveyor, also busy at work circling the red planet. 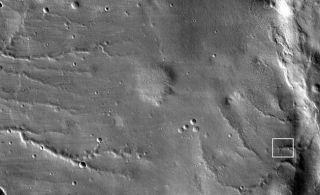 However, Zurek said that the HiRISE resolution and the swath of terrain the powerful camera can scan is a unique combination. Looking ahead, he advised that the HiRISE resolution from MRO's nominal science orbit will improve by nearly a factor of ten. "For me, these images, beautiful as they are, are just a promise of what more will come once we are in the science orbit," Zurek concluded. MRO was launched August 12, 2005 and began orbiting Mars on March 10 of this year. Duty of the spacecraft is to characterize the surface, subsurface, and atmosphere of Mars, and identify potential landing sites for future missions, such as NASA's Phoenix lander that will touch down on Mars in 2008 and explore the martian arctic. The $720 million MRO mission is managed for the NASA Science Mission Directorate in Washington, D.C. by the Jet Propulsion Laboratory (JPL) in Pasadena, California. Lockheed Martin Space Systems in neighboring Denver, Colorado designed, built, and operates the Mars orbiter.